I saw this GORGEOUS photo of this dish on Pinterest -- it was labeled Olive Oil, Garlic, Chives & Romano Cheese Mashed Cauliflower. I attempted to follow the Pin to it's source only to find that it lead to a photo site -- not a recipe site. I was able to track down the origins of the photo -- Goddess of Scrumptiousness (don't you just love that name?) 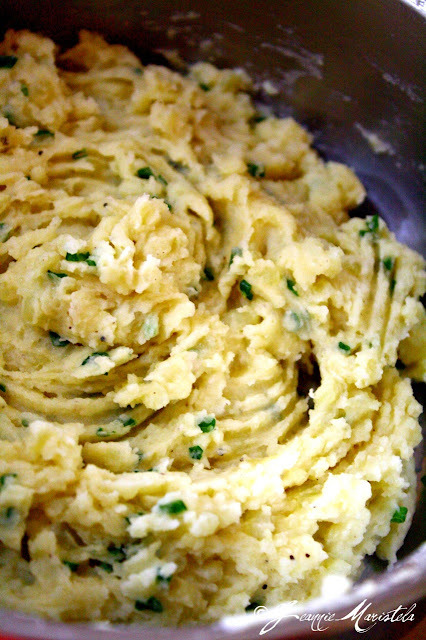 and there was the recipe -- for Olive Oil, Garlic, Chives & Romano Cheese Mashed POTATOES. By this time I was determined to make this -- for a dinner party that was only a couple days away.....a recipe Re-mix was in order because nothing else was going to do, lol. I have made many a potato-like dish with cauliflower and I have always been happy with the flavor of the resulting dish -- however the consistancy is always a bit off for me. Cauliflower has a lot more moisture in it than does potatoes and then boiling it to death just magnifies the waterlogging process. Skipping the boiling in the original recipe, I decided to bake my cauliflower. GREAT decision. I also decided that the garlic flavor was enough and skipped the chives -- maybe this summer when my chives are needing sheered back I'll do this again with the chives -- they add pretty factor as well as flavor. Very happy with the resulting dish -- was a perfect match to pork chops and green beans, has moved to my FAVORITE cauliflower dish and seemed very well liked by my company. Clean cauliflower and break into large flowerette pieces. In a large piece of aluminum foil, tightly wrap cauliflower flowerettes and peeled garlic cloves that have been seasoned with salt and pepper and place in 350°F oven and bake for 45-55 minutes or until tender. Put into casserole dish and mash to desired consistency (I like a little texture to mine). Add EVOO and cream and mix in well. Add the grated Romano cheese and season with salt and pepper as desired. Makes 3-4 servings. Can be made ahead and reheated in a 350°F oven until piping hot. Gooseberry Patch's Rush-Hour Recipes Review & A GIVEAWAY!! Be Prepared -- The Low-Carbers Motto! The content of this blog is written by me - I am not a medical doctor or a registered dietitian. I write based on my own experience with a Low Carb diet and losing and maintaining 110+ pounds. All nutrition facts on recipes are calculated at FatSecret.com. 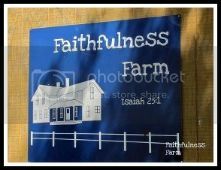 Sign up to get Faithfulness Farm blog posts delivered to your email box!